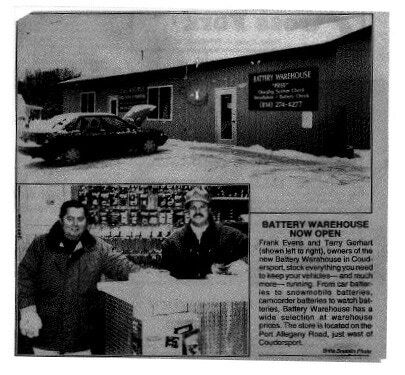 E & G Auto Plus- Battery Warehouse was founded in 1996 by two co-workers and best friends, Frank Evans and me, Terry Gerhart. Frank and I worked together for 14 years and when I say work, I mean from 8am to 8pm Monday - Friday and Saturdays till 4pm. Our vision was to start our own little auto dealership that was committed to giving quality reconditioned cars, trucks, vans or sport utilities, at a very competitive price! ​We soon realized vision and dreams are one thing, and reality is another. Coming up with the funding for this vision seemed to be a large obstacle. We were finally able to find some money in the form of a bank loan from First Citizens National Bank of Ulysses. I can clearly remember when we first started. We had 10 cars and we could sell each one for $3000.00. Not only that, our wonderful customers had to wade through an inch of mud to get one! The good thing was that we consistently moved our inventory for years and if our customers had a problem, so did we. The word soon got around and now, after 21 years of being in business, we have sold thousands of quality automobiles in our market! We thoroughly enjoy our customers and we enjoy our work. We love to serve you and consistently meet your needs!